We are a Florida based Law Firm that devotes 100% of our practice solely to helping America's working men and women throughout the country, who have unknowingly fallen victim to Mesothelioma, Asbestosis, or Lung Cancer as a result of exposure to Asbestos. Mesothelioma is a lung cancer caused by inhaling asbestos fibers. Mesothelioma can be lethal, and can be caused by inhaling even the smallest (microscopic) asbestos fibers. Approximately 2,500 to 3,000 people are diagnosed with mesothelioma every year. Because the tiny asbestos fibers can lie hidden in your lungs for decades before being discovered, the risk of developing mesothelioma increases with age. One unique characteristic of asbestos-related injuries is the long period of time between exposure to asbestos and the onset of injury or disease. When mesothelioma is diagnosed in the United States, its onset is typically linked to a prolonged exposure to asbestos fiber, or an extended asbestos exposure. Unfortunately, very little exposure is required to set this cancer in motion in many cases. Certain occupations are typically associated with the onset of mesothelioma later in life. The treatment and outlook for those with mesothelioma depends a great deal on the stage of their cancer. Because the most frequently occurring type of mesothelioma is pleural and it is also the one most studied, it is the only type for which a staging system exists. If you have mesothelioma, or any other asbestos-related disease, chances are you were exposed to asbestos. Many of the manufacturers of asbestos insulation products knew that asbestos was hazardous, yet made a business decision not to warn people of those hazards for decades. You may have a right of recovery against those manufacturers, which can help cover the costs of cancer treatment and provide compensation for your suffering. If you, a family member, or a friend has been diagnosed with an asbestos related illness, we may be able to help you obtain compensation for this illness. 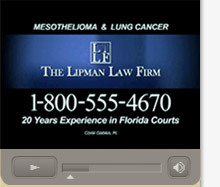 For legal advice regarding mesothelioma or other asbestos related cancers, contact the lawyers at The Lipman Law Firm today.